In the summer of 1850, America was at a terrible crossroads. Congress was in an uproar over slavery, and it was not clear if a compromise could be found. In the midst of the debate, President Zachary Taylor suddenly took ill and died. The presidency, and the crisis, now fell to the little-known vice president from upstate New York. In this eye-opening biography, the legal scholar and historian Paul Finkelman reveals how Millard Fillmore's response to the crisis he inherited set the country on a dangerous path that led to the Civil War. 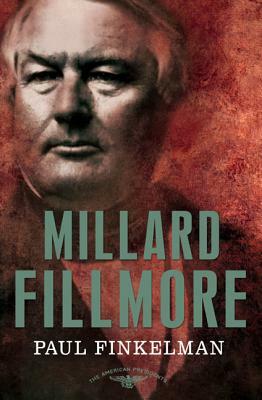 He shows how Fillmore stubbornly catered to the South, alienating his fellow Northerners and creating a fatal rift in the Whig Party, which would soon disappear from American politics—as would Fillmore himself, after failing to regain the White House under the banner of the anti-immigrant and anti-Catholic "Know Nothing" Party. Though Fillmore did have an eye toward the future, dispatching Commodore Matthew Perry on the famous voyage that opened Japan to the West and on the central issues of the age—immigration, religious toleration, and most of all slavery—his myopic vision led to the destruction of his presidency, his party, and ultimately, the Union itself. Paul Finkelman (PhD, University of Chicago) is the President William McKinley Distinguished Professor of Law and Public Policy and Senior Fellow in the Government Law Center at Albany Law School. His many books include Landmark Decisions of the United States Supreme Court (2008) and A March of Liberty: A Constitutional History of the United States (2002), which he coauthored; The Encyclopedia of American Civil Liberties (2006) and The Encyclopedia of the New American Nation (2006), which he edited; and Slavery and the Founders: Race and Liberty in the Age of Jefferson (2001). For the Bedford Series in History and Culture he edited Dred Scott v. Sandford: A Brief History with Documents (1997) and Defending Slavery: Proslavery Thought in the Old South: A Brief History with Documents (2003). Finkelman has also published numerous scholarly articles on American legal history and civil rights, and he lectures frequently on these subjects.